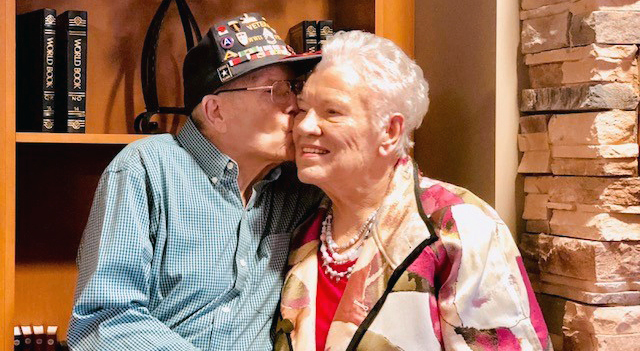 William Hall, a WWII veteran, knows all about war but he also knows a thing or two about love. Valentine’s Day is also his birthday. CHERRYVILLE, N.C. — William Hall is a World War II and Vietnam veteran. His room is filled with old photographs, medals and certificates of his time overseas. Hall knows all about war, but he also knows a thing or two about love. Valentine’s Day is also his birthday, and on Wednesday Hall turned 90. He moved into Peak’s Resources Nursing home last year after his wife passed away. His neighbor is Mildred Conner. She’s also ninety years old and lost her husband almost twenty years ago. “I said then, I’ll never get married again,” she explained. She believed it too, until a familiar face kept walking by her door with his signature smile. “He’s always got a smile on his face,” Conner said. They started sitting at the same cafeteria table, where breakfast turned into lunch, dinner and a little more. That story sparked a smile from Conner, and that first kiss started a love story that begins the same way every morning. “At exactly six o’clock every morning I go wake her up. And it’s a privilege. It’s a privilege to wake her up,” Hall said. But after March 10th, he won’t have to knock on the door in the morning. “He said, ‘Well, what would you think about marrying me?’ I told him I’d have to think about it,” Conner said. Her family is planning the big wedding she never had, complete with a cake, a bridal party, over 200 guests, and even the wedding dress of her dreams. “Everybody was saying ‘Oh, that looks so good on you! That looks so good,’” Mildred said of the dress she picked for the wedding. It’ll be a celebration of a love that was ninety years in the making and a lesson that it’s never too late for love. “That would be an example for anybody, don’t just give up,” Hall said.